I’m sliding down an almost vertical trail, grabbing tree roots for balance when I can. Under my mud-covered shoes, the slippery ground makes it difficult to find traction. Above my head, a pair of Jaco parrots are screeching. 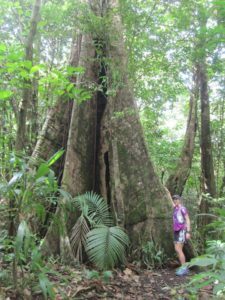 The canopy of rain forest gives way to a clearing filled with banana plants and grapefruit trees. A brief tropical shower has washed the sweat off me, and some of the dirt. Now, the sun is out again, its brightness filtering through overhanging branches. In the West, the distant peak of Morne Diablotin rises, still shrouded in mist. Toward the East, the turquoise expanse of the Atlantic ocean peeks through a panorama of jungle-covered ridges dotted with pastel-colored farm houses. My husband has stopped to take pictures at a river we crossed a while back, so I am alone for the moment. The parrots have stopped screeching. Silence falls when, suddenly, a tall, dreadlocked figure wielding a machete steps out of the bush and walks toward me. No, this was not the end of me, though. 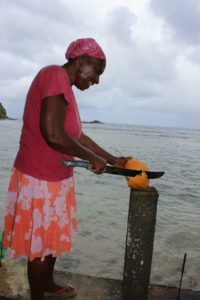 On the Caribbean island of Dominica, most people, including Molly, our 70-year old landlady, carry these long, curved knives that look like menacing and effective murder weapons. 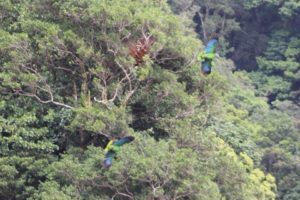 But they don’t often use them to attack anything other than coconut shells, or the dense vegetation that encroaches on trails, crops, and gardens. That day, the banana farmer waved a friendly hello. I stopped to return the greeting, when he saw my husband running up the trail behind us. I reassured him of David’s benign intentions. 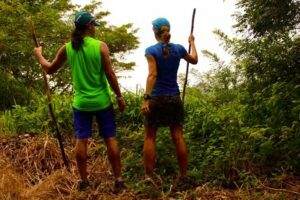 After a brief conversation about the beauty of the island, we continued on our respective journeys through the jungle, he to his hillside fields and we back to our eco-lodge. Not to be confused with the Dominican Republic, Dominica, aka the Nature Isle, is a rugged, wild sort of a place that defies Caribbean stereotypes. Pirates of the Caribbean was filmed here. If you’ve seen Johnny Depp trying to escape from his captors, running along stretches of black sand and jumping off cliffs, you’ve glimpsed Dominica in a supporting role. There are no white-sand beaches covered in lounge chairs and umbrellas, no all-inclusive five-star resorts, no duty-free shopping malls. On days where cruise ships dock in the capital of Roseau, tourists swarm around a couple of attractions that are easy to get to from paved roads, like the Emerald Pool. Otherwise, it’s a fairly quiet place, even in the high season, i.e. over Christmas and New Year’s. 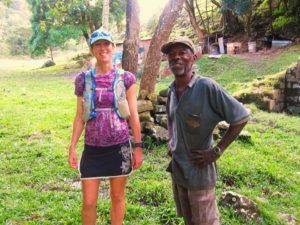 For trail runners who don’t mind a little, or a lot, of sweat and mud, Dominica is an ideal destination. The scenery is breathtaking: mountain ranges, rain forest, waterfalls, a boiling lake, 365 rivers, hot sulphur springs. Hundreds of miles of trails link these natural wonders, criss-crossing the island. Some are short, easy jaunts, others grueling challenges that require scaling down cliffs while hanging on to ropes. 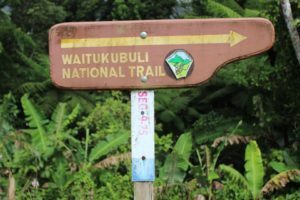 The star attraction is the 110 mile long Waitukubuli National Trail. Its fourteen segments traverse the island from South to North. 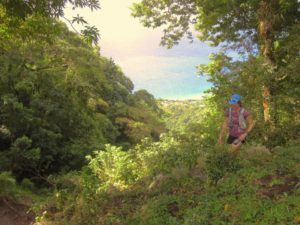 We have traveled to Dominica four times, and we still have many miles of trail left to explore. 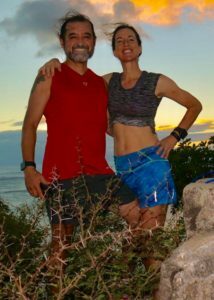 Other tropical destinations may have some run forest, but no trails. 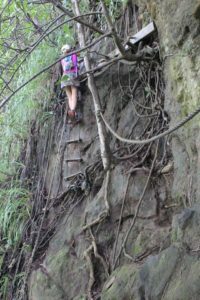 Or if they do, poisonous snakes and other predators make exploring these trails without a local guide impossible. 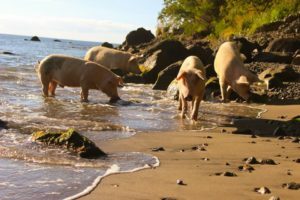 Dominica is a wild and rugged place, yet a very safe one. The scariest encounter I’ve had was with a boa constrictor. These snakes look scary, but are harmless to humans. Otherwise, the only natural hazards we encountered were slippery rocks, mosquitoes, and razor grass. The people are genuinely nice. In four trips to the island, we have encountered only one unfriendly landowner who chased us off his property when we accidentally trespassed. We found out later that he is from New York, not Dominica. 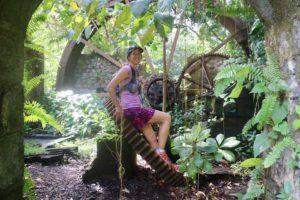 Instead of doing what most tourists do, which is spending just a few hours on Dominica as part of a cruise, consider staying a week or more. It’s easy to find a cabin or yurt on Airbnb and rent a four-wheel drive vehicle to get there, driving on the left side of bumpy, steep, and narrow roads. There are few road signs, but you can ask anyone you see for directions. If you’re curious about this amazing destination, please message me. 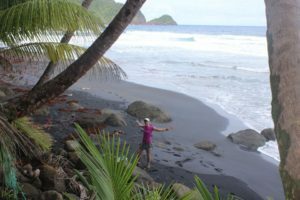 If you go, enjoy the trails, and the black-sand beaches. Also, be sure to . . .
1. Be ready for muddy conditions. 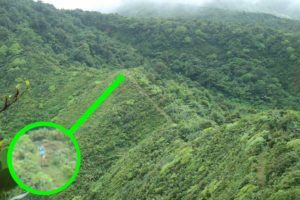 Much of Dominica is covered in rain forest, which means it rains a lot. Use ziploc baggies for your phone, camera, and extra socks. 2. Drink the water. Yes, really. It will refresh you, not make you sick. Every village has a public tap where you can refill bottles and packs. It is also safe to drink from any of the 300-plus rivers. 3. Stuff a swimsuit into your pack, though many places are so remote that you can get away without one, too. 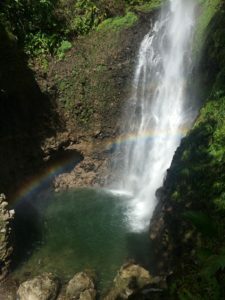 Chances are you will find a secluded beach or a swimming hole, maybe under a waterfall. Jump in, the water’s fine. 4. Bring a headlight, even if you think you won’t need it. I learned this one the hard way. Darkness falls quickly in the tropics, especially under the rain forest canopy. 5. Last but not least, be ready to slow down. Way down. 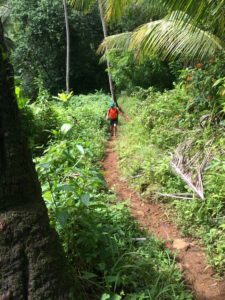 Most of the trails on Dominica are steep, slippery, technical, or all of the above. It’s pointless to worry about mileage. Stop often. Look around. Feel the trade wind drying the sweat on your skin. Take a picture. Talk to the farmers. Have a ginger shandy at a bar in any of the villages and chat with the locals. Climb the mountains. Swim in the rivers. Feel like the luckiest person alive. I did, every day we were there. This entry was posted in Uncategorized on January 10, 2017 by silvakat.